Mumbai: The ₹ 100 note is the most counterfeited Indian currency, with its popularity among forgers having surged since the government invalidated high-value banknotes about two years ago to curb the menace of fake notes and unaccounted wealth. Around 46% of counterfeit currencies (by number of banknotes) detected by banks in the year ended 31 March was of ₹ 100 denomination, while counterfeit notes of ₹ 2,000 and ₹ 500 put together were at 29% of the total pieces, according to the Reserve Bank of India’s (RBI) FY18 annual report. In the previous year, ₹ 500 notes were the most counterfeited, accounting for 41% of all fake currencies detected. The withdrawal of the ₹ 500 and ₹ 1,000 banknotes in November 2016, however, seems to have put the brakes on counterfeiters, with detection of fake notes dropping 31% in the year ended 31 March from the previous year, the annual report said. However, there was a rise of 35% in counterfeit notes detected of ₹ 100 denomination from a year earlier. There was also a 154% surge in counterfeit notes detected in the denomination of ₹ 50, the central bank said in its annual report, indicating forgers have started targeting lower-denomination notes post demonetization. 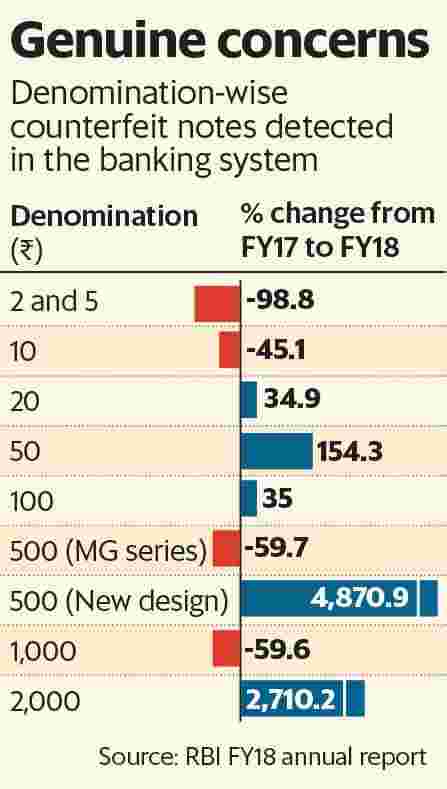 For the series of banknotes in the denominations of ₹ 500 and ₹ 2,000 introduced after demonetization, counterfeit notes detected during 2017-18 jumped to 9,892 and 17,929, respectively, from 199 and 638 in the previous year. State Bank of India (SBI), in its 29 August research report Ecowrap, said RBI’s promise that new currency notes of ₹ 200 and ₹ 500 (post-demonetization) are more secure and less prone to counterfeiting is not entirely correct. “There was a noticeable increase in counterfeit notes detected in the denomination of new ₹ 500 and ₹ 2,000 (by 2,710%)," RBI’s annual report said. “Given the current trends, it is expected that the number of counterfeit notes in the denomination of ₹ 500 (new) and ₹ 2,000 may increase further and RBI/banks/public should pay more attention to that." During 2017-18, 522,783 pieces of counterfeit notes were detected in the banking system, of which 63.9% was detected by banks and the rest by the central bank. The number of fake Indian currency notes detected by the central bank increased to 36.1% of the total detected notes in fiscal 2018, compared to 4.3% during the previous year. The central bank attributed this increase to the processing of a large volume of specified banknotes withdrawn from circulation owing to demonetization.